If you dig fusion jazz and you really want to give your stereo system a workout, check out the new CD from Cpt Kirk, the new trio headed by extraordinary bassist Rufus Philpot. 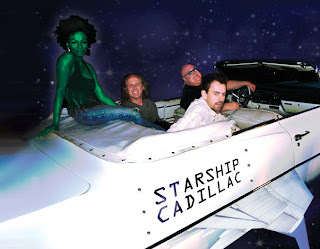 Philpot, along with drummer/singer Kirk Covington and keyboardist Scott Tibbes, race at breakneck speed through a set that is one third Parliament/Funkadelic, one third Bill Evans and one third atomic-age sound effects. Dan Muzquiz of Blackbird Audio, who is a buddy of Rufus', snuck this CD in with the Heed Audio amps he sent me last week, and if any piece of music can show off how potent the little Obelisk is, it's this one. For example, take the first ten seconds of the title tune. A tympany is thwacked, and the resulting bloom and decay flows through my listening room like a steel-railed roller coaster. If anyone doubts that my diminutive Trenner & Friedl ARTs can produce deep and realistic bass, I'll just slip 'em this little snippet and watch their jaws drop. Sure, the drum sounds like there might be a touch of electronic embellishment, but who cares. If you need to hear real instruments in a real space, Tibbs spends plenty of time at his grand piano and combines romantic flourishes with angular, atonal sorties. Philpot, who has been acclaimed by reviewers and fellow musicians alike, infuses plenty of personality into his instrument and is one of a growing generation of bassists who step beyond the notes and create a manic, textured landscape that is endlessly detailed. An added plus is the great names for all of the songs such as "Drop the Chalupa," "Disgruntled Consumate Monkey" and "Pickled Pigs Feet." This exciting, funky and whimsical album has some serious musical chops dwelling in its crawlspace, and I look forward to freaking out some visitors to my listening room with it. To buy this album, simply visit Philpot's website at http://www.rufusbass.com/. How can I buy your new album 'Starship Cadillac' in MP3 on Web ? I heard on your home page, THAT WAS BRILLIANT!!! It would be a total shame to listen to this in MP3 - PLEASE - enjoy ALL the amazing essence of this disc in FLAC - on BIG system - it's STUNNING.